Dal, pictured in the top center, is poured over rice or eaten as a high-energy soup. Dal is a staple in many Nepali meals and is usually served with rice and vegetables. 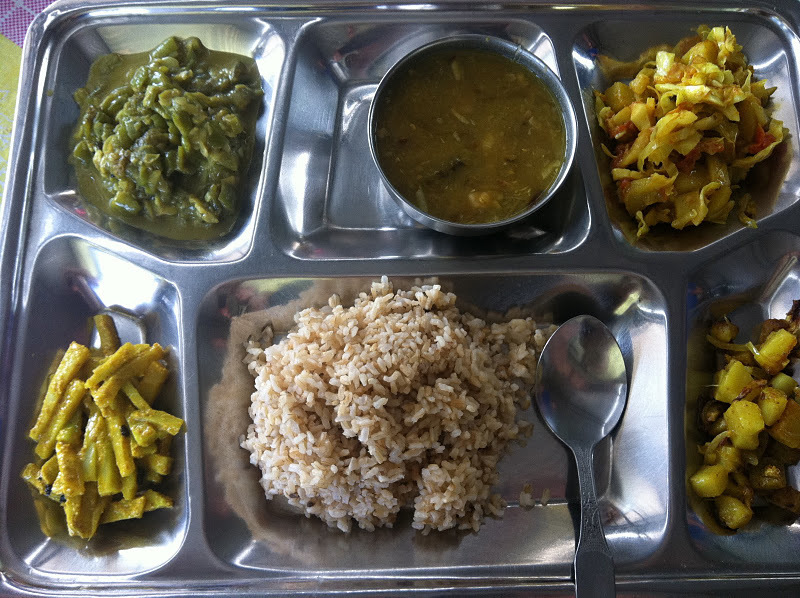 It is a healthy, protein-rich food and kept us energized as we hiked the Annapurna Circuit in the Himalayas. Puree this mixture with ginger and green chili in food processor until smooth. Return to pan and bring to simmer. Add salt, sugar, and tamarind and stir to dissolve the tamarind. Remove from heat. Heat oil in a 6-inch skillet over medium-low heat. Fry black mustard seeds for a few seconds. As soon as the seeds start popping remove from heat and pour contents of pan over the lentil mixtures. Simmer 2 to 3 more minutes. Stir in the pinch of other spices. Cover and let stand for a few minutes to help develop the flavors. You may choose to garnish with lemon wedges and cilantro and serve with rice.